Biscuit: Preheat the oven to 150C. Sift powdered sugar and almond flour, add the coconut. Whip the whites in stable foam, gradually adding sugar. Gently, using a silicone spatula stir dry mixture into egg whites. Fill in the mass into a cooking bag with flat and round nozzle №12. 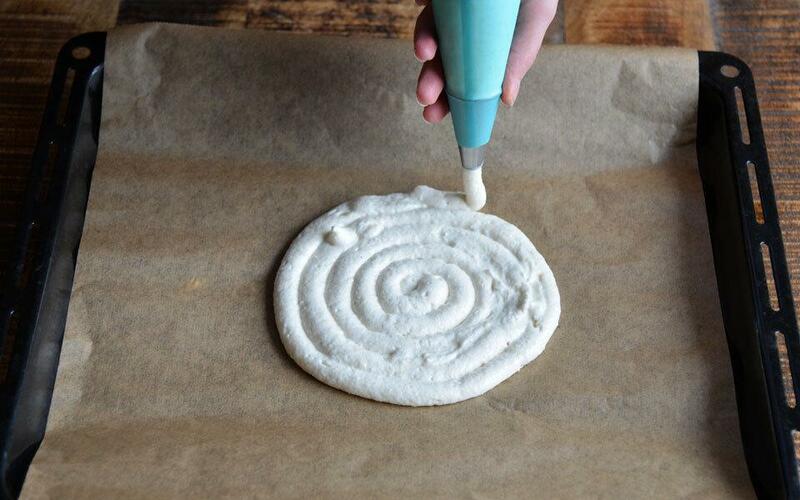 On a baking sheet lined with parchment paper, place the spiral - from the center to the periphery, 2 circles with a diameter of 22 cm. Lightly sprinkle with sifted icing sugar. Let stand for 10 minutes. Again sprinkle with powdered sugar and let stand another 10 minutes. Then bake your cakes in preheated oven for 30-35 minutes. 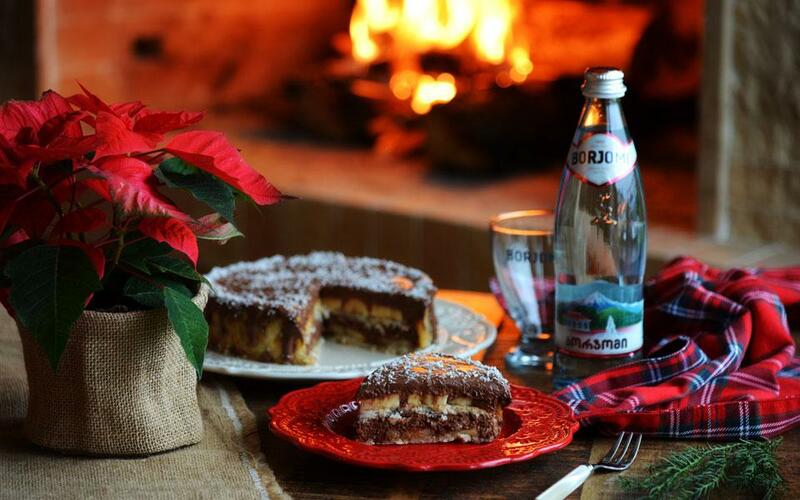 Remove the baking sheet from the oven, gently shift cakes on a grill and allow to cool completely. Then tighten in plastic wrap and store in the refrigerator overnight. 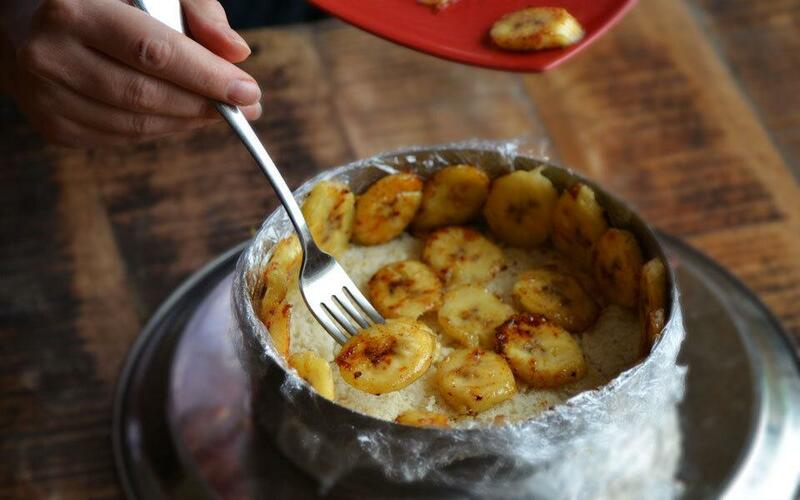 Stuffing: Slice the bananas into circles of 1 cm thick. Pour the lemon juice. Melt the butter In a frying pan over high heat. Put it in bananas. Sprinkle with brown sugar and drain. Chocolate mousse: Place an empty bowl for whipping in the freezer for 15 minutes. Mix water and sugar, and simmer for 3 minutes (125C). Whisk the egg yolks in a bowl with a whole egg. Continuing to whisk, pour a thin stream of hot syrup. Continue whisking until the mixture turns white, increases in the amount three times and cools down. Chop the chocolate and melt in a pan in a water bath. Cut lemon with a thin peel and finely chop it. Enter zest together with the ginger into the melted chocolate. Tempering chocolate. Whip the cream in a cooled bowl. Pour into it tempered chocolate. Then gently add the beaten egg yolks and syrup. Mousse should be used immediately. 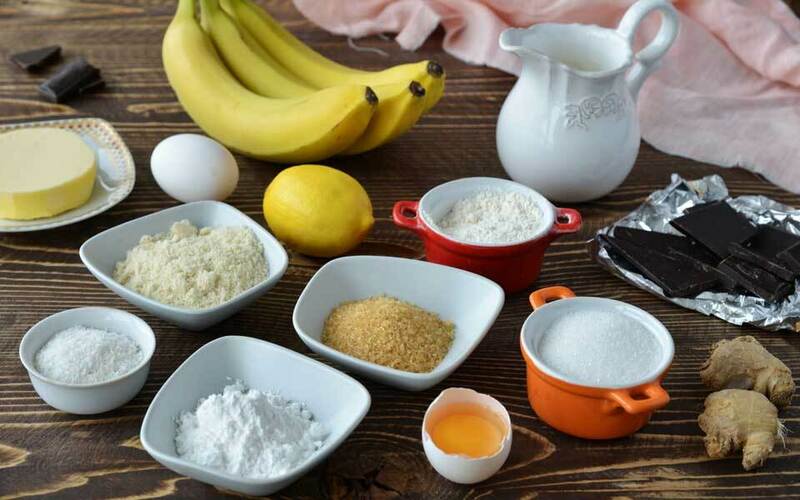 "Building" cake: Cut bananas into thin slices. Sprinkle with lemon or lime juice. Crusts, if necessary - trim the scissors. 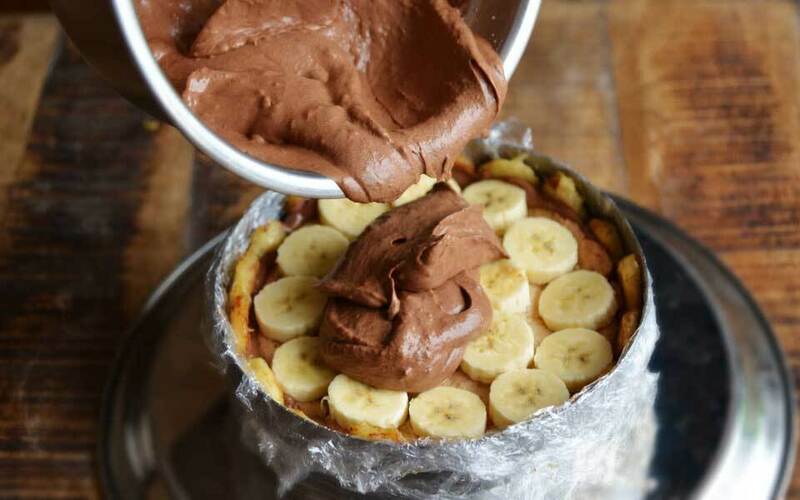 You should have so that in a diameter of 24 cm, the interface between the edge of the cake and a wall of the form must be completely filled with bananas. Gather mousse in a pastry bag with a nozzle №16. Put in a for acetate / curb film. At the bottom put the crust. Put bananas in the circle of the walls, a little obliquely and overlapping. Spread put 1/3 of the mousse. Cover it with circles of banana. 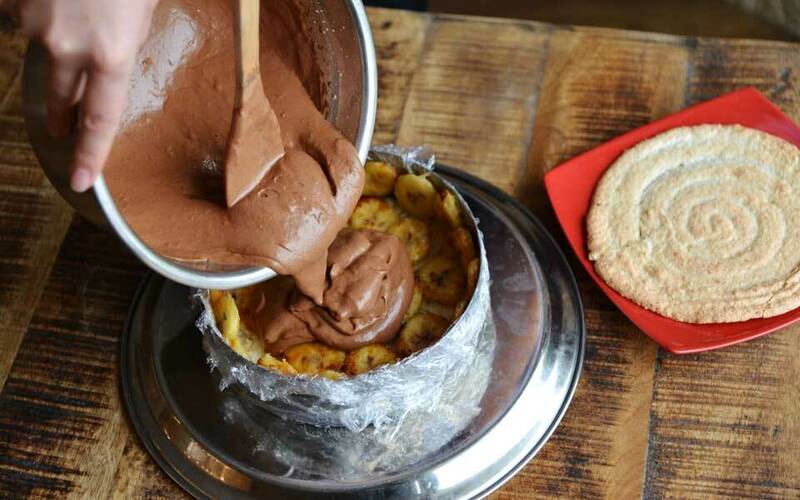 Spread bananas with mousse and cover with another crumb. Cover the top of the cake with the remaining mousse. Put in the refrigerator overnight. Chocolate sauce: Chop the chocolate and pour it in a pan with a thick bottom. Add water, cream and sugar. Bring to a boil over low heat and cook, stirring with a spatula, until the sauce does not become oily and no longer flow down from the blade. Remove the pan from the heat and set aside. Chocolate salt-glaze: Chop the chocolate. In a saucepan with a thick bottom, bring the cream to a boil. Remove the pan from the heat and gradually add the hot cream into the chocolate slowly, stirring well each time from the center of the circle, increasing the radius. When all the chocolate is added and melted, cool your salt-glaze to 60 ° C. Then add the pieces of butter, stirring as small as possible, then, with minimal stirring, add chocolate sauce. The mass should be homogenous. This glaze is used warm 35C-40C. Products using the pouring ladle. If your frosting has had time to cool down and become very dense - warm it up, without stirring, in a water bath. Remove your cake from the fridge. Pour with salt-glaze, cool, and sprinkle with coconut.